Brunswick County Health Services will begin offering flu vaccines on Oct. 1. Nurses will also be administering flu shots at Brunswick County Schools and various locations throughout the community this season. It is estimated that each year approximately 5 percent to 20 percent of U.S. residents get the flu, and more than 200,000 individuals are hospitalized for flu-related complications. The Centers for Disease Control and Prevention (CDC) recommends annual flu vaccinations for everyone six months of age and older. Children younger than five years old and adults 65 years old or older, pregnant women, and people with underlying medical conditions are all at increased risk of severe illness or complications from the flu. 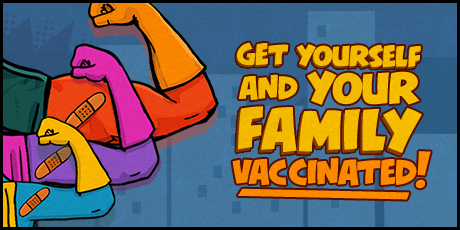 The single best way to help prevent vaccine preventable diseases is to get vaccinated. 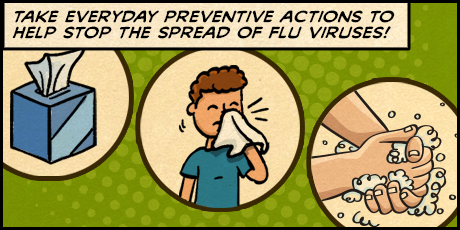 To help prevent the spread of influenza and other viruses, everyone should cover his or her nose and mouth when coughing or sneezing, and promptly dispose of the tissue in a trash can. If tissues are not available, people should cough or sneeze into their upper sleeves, instead of their bare hands. Hands should be washed frequently with warm, soapy water for 10-15 seconds, or cleaned with hand sanitizer when water is not available. Household areas should be cleaned with household detergents, such as bleach or alcohol when appropriate, to keep them sanitized. Avoiding crowds, limiting travel and working from home when possible can all also help prevent the spread of illness. “It’s the most important thing you can do to protect both yourself and your family from the flu,” said Health and Human Services Executive Director David Stanley. The flu shot clinic will begin on Oct. 1 at Brunswick County Health Services Monday through Friday, from 9 a.m. until noon and 1 p.m. until 4 p.m. No appointment is needed. Regular flu shots are $40 while the high-dose vaccine, recommended for people 65 years old or older, is $59. Health Services accepts cash, checks, credit cards, Medicaid, Medicare, Aetna, Blue Cross Blue Shield, Cigna, Medcost, Tricare and United Healthcare. Vaccines will be administered to students at Brunswick County Schools on selected dates. Parents must complete permission forms before the vaccination can be given. For more information, contact Health Services at 910-253-2250. People with flu can spread it to others up to about 6 feet away. Most experts think that flu viruses spread mainly by droplets made when people with flu cough, sneeze or talk. These droplets can land in the mouths or noses of people who are nearby or possibly be inhaled into the lungs. Less often, a person might get flu by touching a surface or object that has flu virus on it and then touching their own mouth, nose, or possibly their eyes. People with flu are most contagious in the first three to four days after their illness begins. Most healthy adults may be able to infect others beginning 1 day before symptoms develop and up to 5 to 7 days after becoming sick. Children and some people with weakened immune systems may pass the virus for longer than 7 days. Symptoms can begin about 2 days (but can range from 1 to 4 days) after the virus enters the body. That means that you may be able to pass on the flu to someone else before you know you are sick, as well as while you are sick. Some people can be infected with the flu virus but have no symptoms. During this time, those people may still spread the virus to others. Content provided and maintained by the US Centers for Disease Control and Prevention (CDC). Please see our system usage guidelines and disclaimer. Flu is a serious contagious disease that can lead to hospitalization and even death. CDC recommends a yearly flu vaccine as the first and most important step in protecting against flu viruses. Flu vaccination can reduce flu illnesses, doctors’ visits, and missed work and school due to flu, as well as prevent flu-related hospitalizations. Everyone 6 months of age and older should get a flu vaccine every year before flu activity begins in their community. CDC recommends getting vaccinated by the end of October. Learn more about vaccine timing(https://www.cdc.gov/flu/protect/keyfacts.htm#timing). Vaccination of high risk persons(https://www.cdc.gov/flu/about/disease/high_risk.htm) is especially important to decrease their risk of severe flu illness. People at high risk of serious flu complications(https://www.cdc.gov/flu/about/disease/high_risk.htm) include young children, pregnant women(https://www.cdc.gov/flu/protect/vaccine/pregnant.htm), people with certain chronic health conditions like asthma, diabetes or heart and lung disease and people 65 years and older(https://www.cdc.gov/flu/about/disease/65over.htm). Vaccination also is important for health care workers(https://www.cdc.gov/flu/healthcareworkers.htm), and other people who live with or care for high risk people to keep from spreading flu to them. Children younger than 6 months(https://www.cdc.gov/flu/parents/index.htm) are at high risk of serious flu illness, but are too young to be vaccinated. People who care for infants should be vaccinated instead. While sick, limit contact with others as much as possible to keep from infecting them. Clean and disinfect surfaces and objects that may be contaminated with germs like the flu. See Everyday Preventive Actions[257 KB, 2 Pages](https://www.cdc.gov/flu/pdf/freeresources/updated/everyday-preventive-actions-8.5×11.pdf) and Nonpharmaceutical Interventions (NPIs) for more information about actions – apart from getting vaccinated and taking medicine – that people and communities can take to help slow the spread of illnesses like influenza (flu). 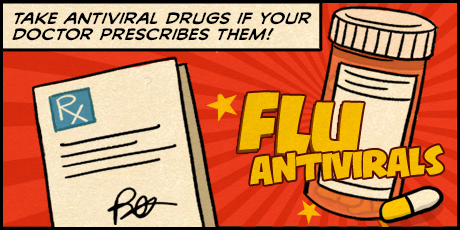 If you get the flu, antiviral drugs can be used to treat your illness. Antiviral drugs are different from antibiotics. They are prescription medicines (pills, liquid or an inhaled powder) and are not available over-the-counter. Antiviral drugs can make illness milder and shorten the time you are sick. They may also prevent serious flu complications(https://www.cdc.gov/flu/about/disease/complications.htm#complications). For people with high risk factors[702 KB, 2 Pages](https://www.cdc.gov/flu/pdf/freeresources/updated/treating-influenza.pdf), treatment with an antiviral drug can mean the difference between having a milder illness versus a very serious illness that could result in a hospital stay. Studies show that flu antiviral drugs work best for treatment when they are started within 2 days of getting sick, but starting them later can still be helpful, especially if the sick person has a high risk factor(https://www.cdc.gov/flu/about/disease/high_risk.htm) or is very sick from the flu. Follow your doctor’s instructions for taking this drug. Flu symptoms include fever, cough, sore throat, runny or stuffy nose, body aches, headache, chills and fatigue. Some people also may have vomiting and diarrhea. People may be infected with the flu, and have respiratory symptoms without a fever. Visit CDC’s website to find out what to do if you get sick with the flu(https://www.cdc.gov/flu/takingcare.htm). Why should people get vaccinated against the flu? Influenza is a potentially serious disease that can lead to hospitalization and sometimes even death. Every flu season is different, and influenza infection can affect people differently, but millions of people get the flu every year, hundreds of thousands of people are hospitalized and thousands or tens of thousands of people die from flu-related causes every year. An annual seasonal flu vaccine is the best way to help protect against flu. Vaccination has been shown to have many benefits(https://www.cdc.gov/flu/protect/keyfacts.htm#benefits) including reducing the risk of flu illnesses, hospitalizations and even the risk of flu-related death in children. How do flu vaccines work? Flu vaccines cause antibodies to develop in the body about two weeks after vaccination. These antibodies provide protection against infection with the viruses that are in the vaccine. The seasonal flu vaccine protects against the influenza viruses that research indicates will be most common during the upcoming season. Traditional flu vaccines (called “trivalent” vaccines) are made to protect against three flu viruses; an influenza A (H1N1) virus, an influenza A (H3N2) virus, and an influenza B virus. There are also flu vaccines made to protect against four flu viruses (called “quadrivalent” vaccines). These vaccines protect against the same viruses as the trivalent vaccine and an additional B virus. Why do I need a flu vaccine every year? A flu vaccine is needed every season for two reasons. First, the body’s immune response from vaccination declines over time, so an annual vaccine is needed for optimal protection. Second, because flu viruses are constantly changing, the formulation of the flu vaccine is reviewed each year and updated as needed to keep up with changing flu viruses. For the best protection, everyone 6 months and older should get vaccinated annually. Does flu vaccine work right away? No. It takes about two weeks after vaccination for antibodies to develop in the body and provide protection against influenza virus infection. That’s why it’s better to get vaccinated by the end of October, before the flu season really gets under way.